Ailsa Craig is a tiny little town in South Western Ontario, Canada. 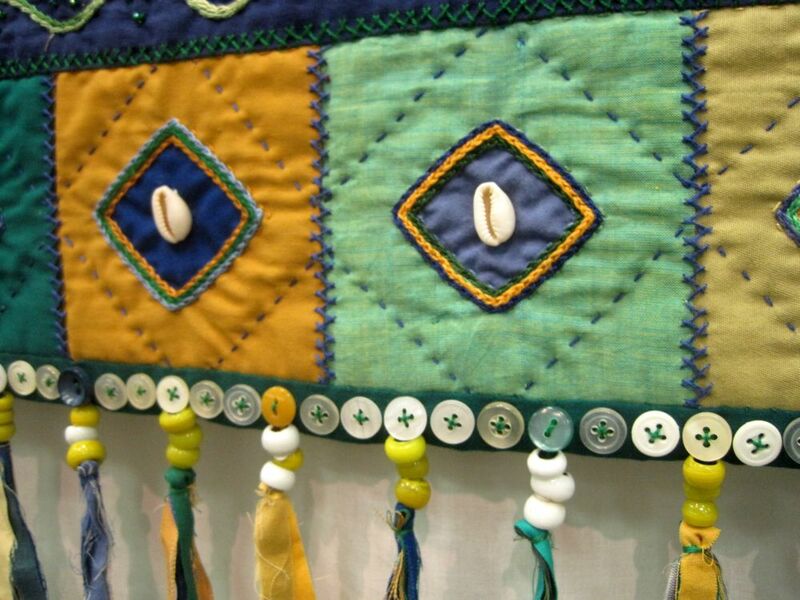 It was there that I was immersed in quilts from Israel! My daughter and I went to see the annual Ailsa Craig Community Quilt Festival. 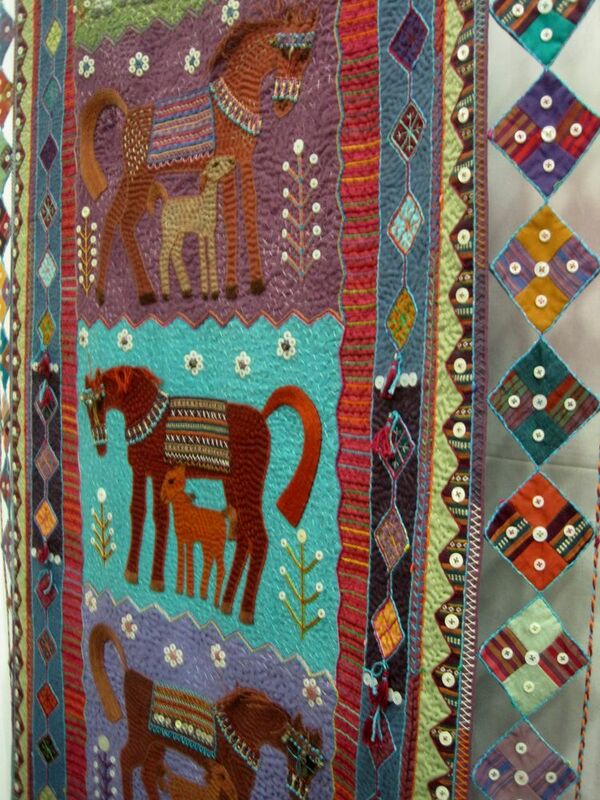 Each year a group of committed volunteers mount an amazing display of quilts from other lands. My absolute favourite quilter in the whole show this year was Linda Bar-On. 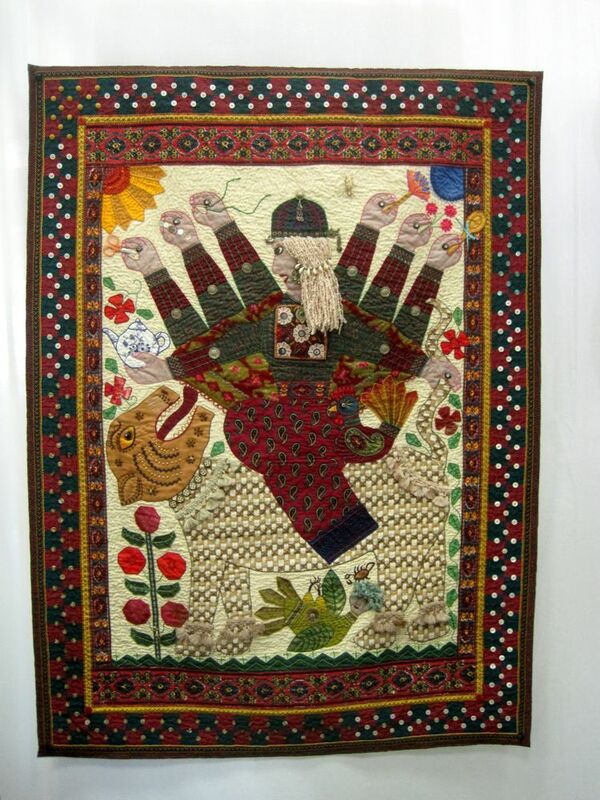 Her quilts are extremely colourful and based on ethnic stories. Ashera: The Hebrew Goddess. She is the chief goddess of the Canaanite pantheon, with El as her consort. She is mother of all the gods and wet nurse to all. She promotes fertility and facilitates childbirth. She cities were Tyre, Sidon, and Elath, but she was found on every high hill and under every leafy tree and in clay form as a household figurine. Of the 370 years of Solomon’s Temple she was present for 236 years. She is mentioned 42 times the the Bible. Despite attempts to obliterate her, she survived because she answered a deep and psychological need for a loving and benign mother goddess and her cult was firmly entrenched in the hearts and minds of the populace. Linda Bar- On was born in 1945. Educated in England she is a self-taught quilter. 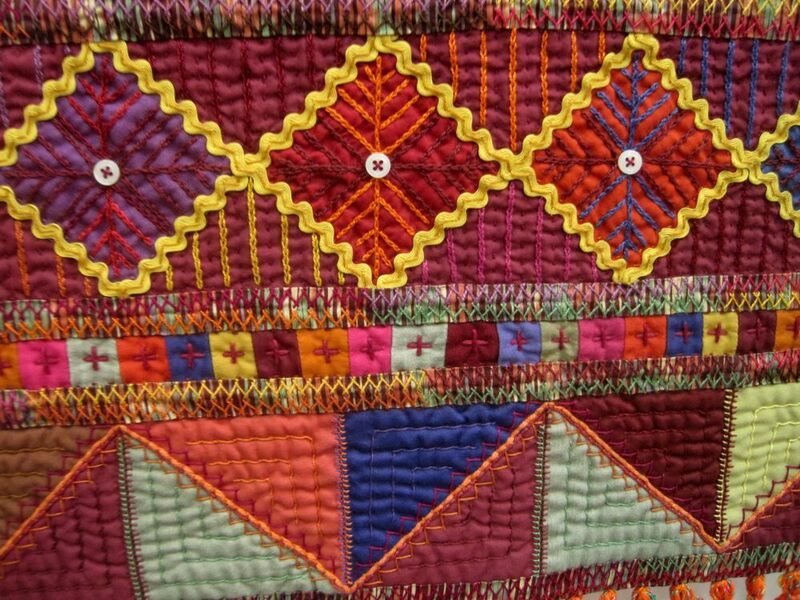 She started with patchwork and quilted clothing. 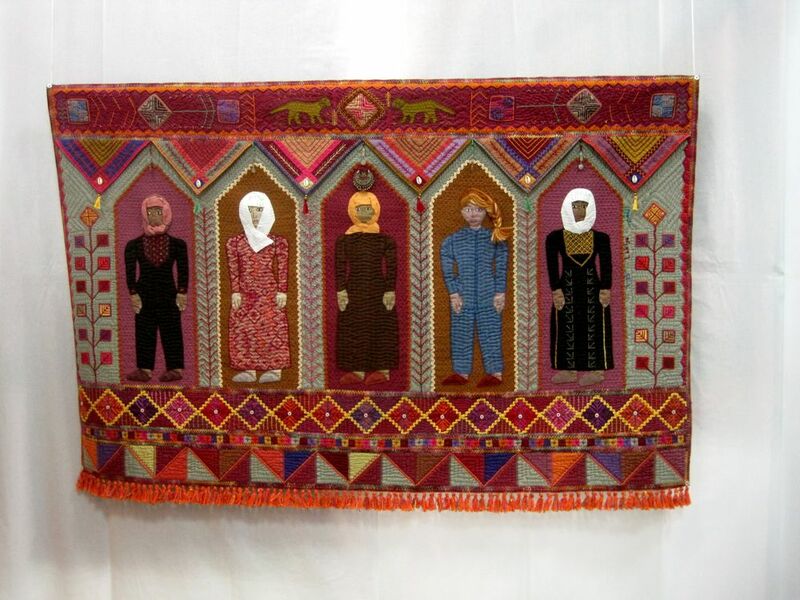 In 1995 she began making wall quilts reflecting life in the Middle East from Asia. 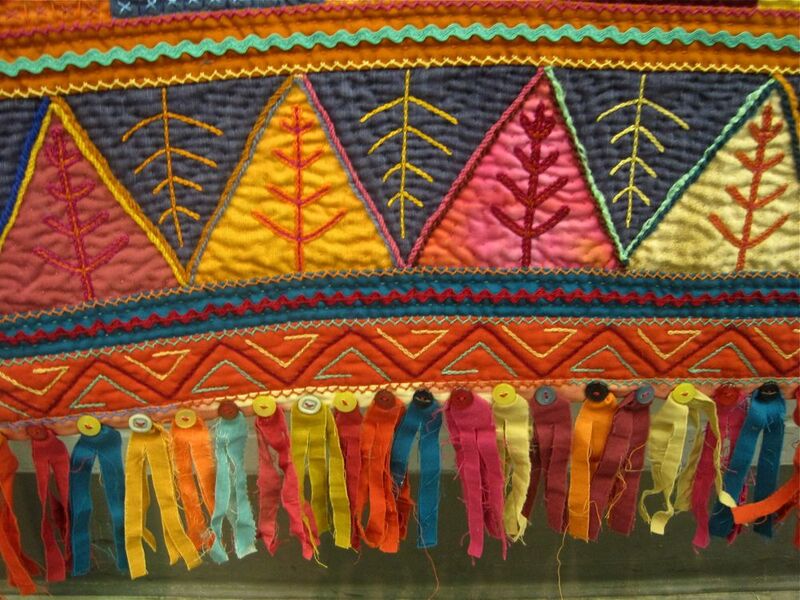 She incorporates embroidery and other embellishments. She has exhibited in Israel, Europe, USA, Japan and Canada. Materials used: cottons, silks, wool felt, braid, buttons, shells, beads, ric-rac. 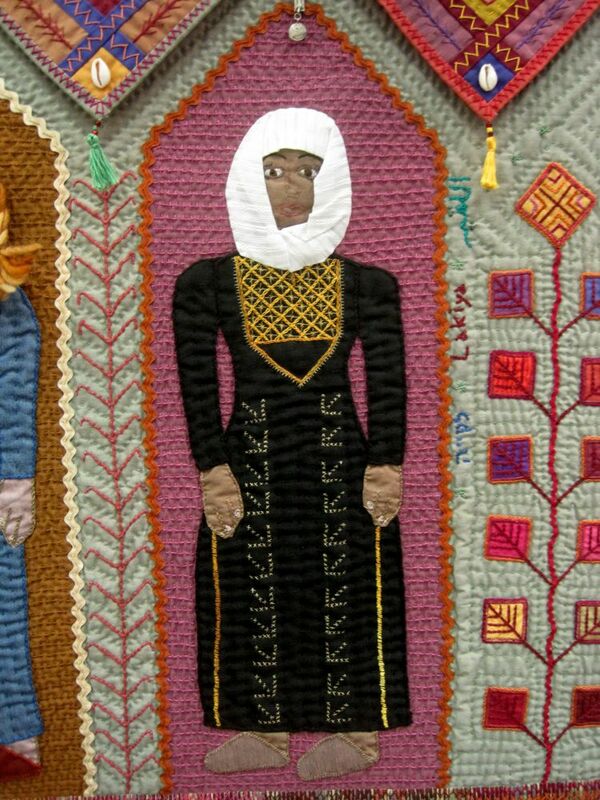 Lion Women of Lakiyeh: The town of Lakiyeh was founded in 1982 as part of a process begun in Ottoman times: the sedentarization of the semi-nomadic Negev Bedouin – a drastic shift from a hard way of life to ordered unbanization. The association for the improvement of women’s Status helps to empower local women. 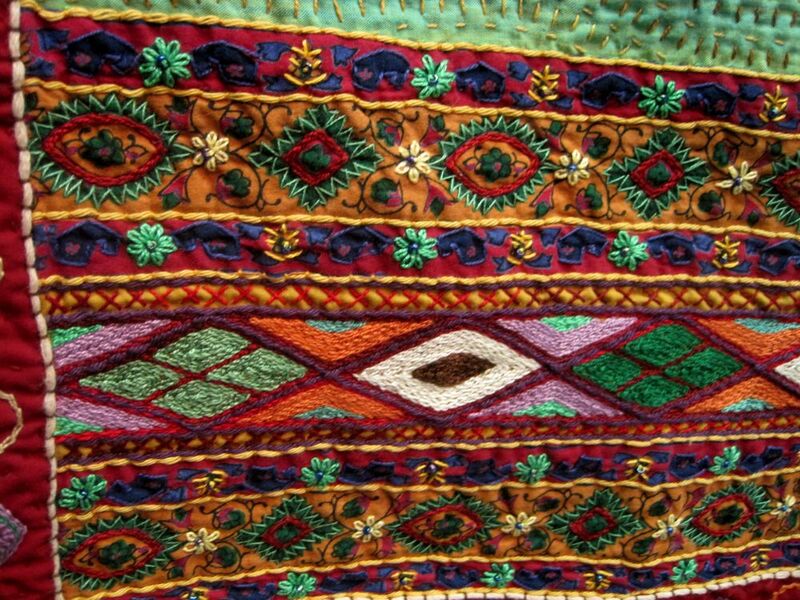 The Weaving Project was founded in 1991 by Roz Welley as Sana, an English nursing volunteer who settled in Lakiyeh. 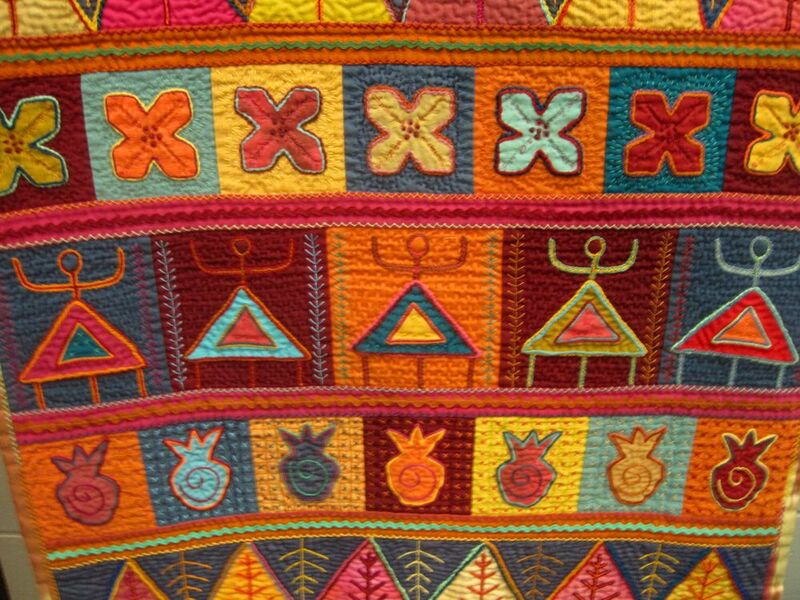 The Desert Embroidery project also keeps traditions alive and provides an income for many families. Some of the more conservative elements in the town have objected to this show of female strength and have even gone so far as to attempt to burn down these projects. The women refuse to remain silent. Riding the Tiger: The tiger symbolizes power, will and determination. By riding this ferocious beast one masters these attributes and conquers the demon of ego. Durga is fearless, releasing her devotees from fear itself. She redeems those in situations of utmost distress. With her eight hands she protects from all directions. She is the Shakti, the warrior aspect of the Divine Mother and the embodiment of the creative feminine force in a state of independence from the universe, showing self-sufficiency and fierce compassion. She never loses her sense of humour or patience. Her weapons in this case are domestic rather than warlike. 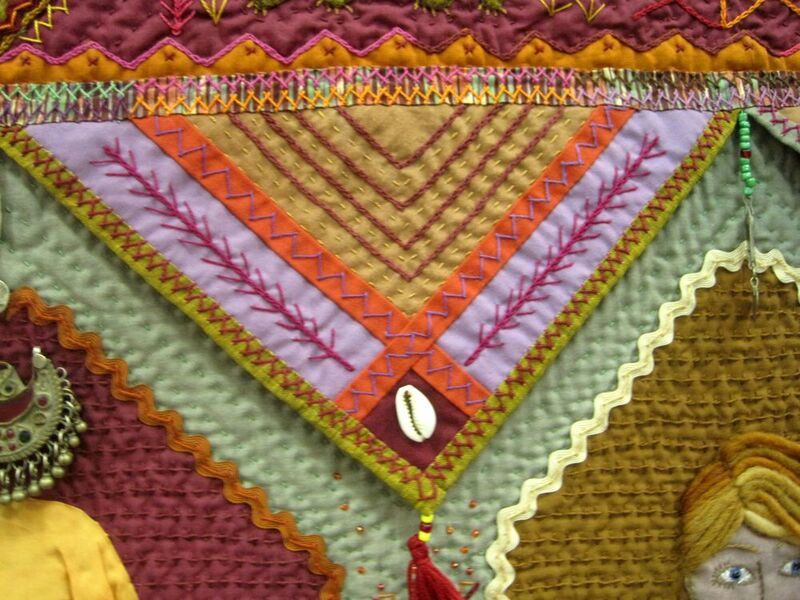 I was really moved by Linda’s work; the colour combinations, the detail, the exquisite embellishments and her ability to translate story into art through fabric and thread. Symbols dripping with meaning. A real testament to “women’s work”. 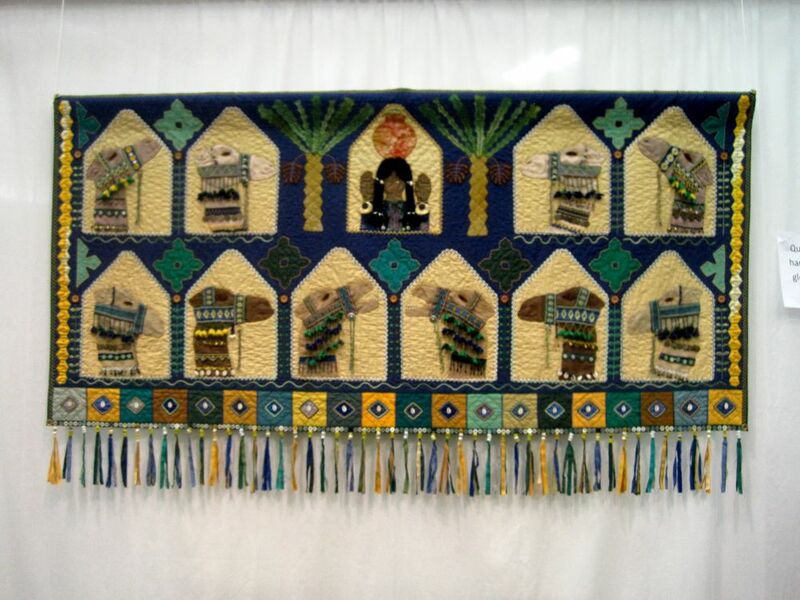 This entry was posted in News and tagged Israel, quilts, thread, women on May 25, 2013 by nurturingspace. Gorgeous work, Ev…combined with very deep and broad research makes this display an even greater accomplishment. Thanks so much for sharing. I’ll be watching out for this artist’s work in future. Linda sent me your name. I have posted your blog`s link on my blog. [it is in Hebrew but it has a translation knob!] , as you might have noted from the Trackback i have posted to you. You are invited to browse in my blog and find what i wrote about Linda`s art over the years. P.S. i also curated her in some Fiberart Group exhibitions, in Israel. Thank you for visiting the Ailsa Craig Quilt Festival! I found your comments thoughtful and was delighted to see that friends of Linda’s had commented. As the Workshop Director for the Festival, I can’t tell you how thrilled we were to have such amazing and beautiful works of art on display. Thank you for posting.